What Makes this Dog so Affectionate? Are Chorkies Right for You? 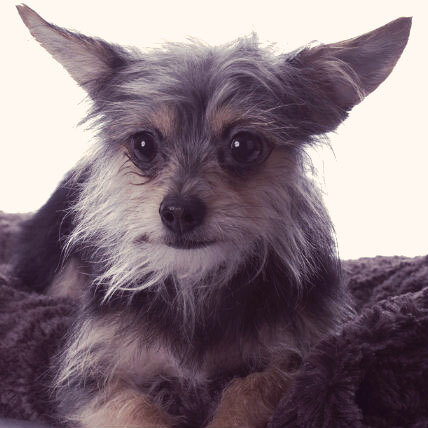 Chorkies love an abundance of attention and affection and are happiest in your lap. Due to their small stature, Chorkies could be easily injured by bigger dogs and even small children. They barely shed, making them ideal indoor pets. Chorkies are a crossbreed between a Chihuahua and a Yorkshire Terrier. This breed became popular in the late 90s due to their conveniently small size and loving personalities, as well as the many desirable characteristics that they retain from their Chihuahua and Yorkshire Terrier ancestors. Some Chorkies can be long legged while others can be short and stout. They are long and slender, making them athletic dogs. They typically have a a fluffy, medium length coat. They have a small black nose and big eyes. The size of their ears can vary from short to long. Chorkies are affectionate dogs who enjoy plenty of attention from their owners. In fact, they love attention so much that they prefer sitting on their owner's lap over playing with other dogs or entertaining themselves with toys. They are highly social, getting along with other pets and strangers very well. Chorkies are also very loyal and protective of their owners. Chorkies are most commonly found in brown, black, tan, grey, and white. The coat of a Chorkie can become grey as they age.